​Is it a legit broker? Expert Option is a binary option trading platform that has been in operation since 2015. It has its headquarters in St Vincent and Grenadines with other offices in the UK and India. It is regulated by Russian based regulator FMRCC under license number TSRF RU 0395 AA Vv0084. Expert Option has become very popular with eastern European and Russian markets. Its website is available in Russian, English, German, Portugal, Spanish, Italian, Chinese, Hindi languages. There is no clear estimate of Expert Option’s customer base. Opening an account with Expert Option is possible for anyone in the world even in the US unlike some brokers who restrict US citizens. The process of opening an account is straightforward. Only the name, email and telephone numbers are required. There is no email activation or token verification. Unlike many binary trading platforms that offer new traders a demo account immediately on opening an account, Expert Option demands that the first thing a new trader does is deposit a balance. A minimum of $250 is required. A new trader cannot proceed to the trading dashboard without making the deposit. A demo account is activated after making a deposit. The demo account is loaded with virtual $10,000. This account requires the lowest minimum deposit at $250. This account gets a personal assistant with live chat. A new trader has the option of practicing with a demo account. There is a 20% bonus for the deposit. Withdrawals are available in 1 hour. This account gets a demo and live video chat to start off the trader. The minimal balance is $1,000. For this, the trader gets a master class which is conducted as a webinar. The trader is also allowed the first 3 trades risk free. The trader will get a 50% bonus for opening a silver account. The minimum balance for this account is $3,000. For this, a new trader will get a personal assistant broker and live video chat. There is also a master class (web session) and first 3 trades risk free. This account also offers trade protection to avoid excessive loss of funds. The trader will also get a personal success manager and a prepaid Swiss debit card. The bonus for making a deposit is 100%. This account is for the most experienced traders. The minimum deposit is $3000. The trader gets all the benefits of a gold account and a VIP personal manager. There is also prioritized withdrawal. VIP traders are also put on an educational plan if they need to polish up their skills. A daily economic analysis is delivered daily to VIPs. Expert Option is unique in that they have used proprietary software for their platform unlike many other platforms which rely on MT4 and Webtrader technology. This platform uses a combination of robots and human brokers to make the trades. Minimum investment in a trade is $10. The trade’s duration lasts 60 seconds to 15 minutes. This platform offers a unique feature called trade signals. This is a continuous stream of different asset prices and hints on whether to buy or sell. The signals are Strong Buy, Buy, Neutral or Sell & Strong Sell. This makes it easier for inexperienced traders to place trades. The trading platform is easy to use and navigate. Everything is in one place so that placing a trade is a simple matter of a few clicks and adjustments to the trade settings. 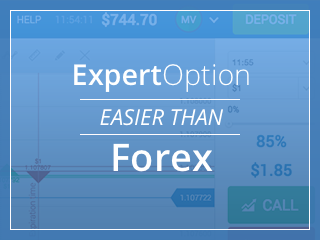 Currencies – Expert option offers over 40 currency pairs. This platform is unique in that they have a pair for digital currencies. It is possible to trade Bitcoins against dollars. It is the only binary platform so far that has offered the Chinese Yuan in exchange for bitcoins. Another unique feature is the ability to place currency futures. The available futures are AUD/USD, EUR/JPY, USD/JPY, GBP/USD, and EUR/USD. Commodities – Expert Option allows trading in silver, platinum, sugar, coffee, gold and oil. It is possible to place trades on gold futures and oil (light sweet crude). Indices – there are over 30 indices on Expert Option. These include indices from the US, Europe, Asia and the Middle East. Stocks – There are over 100 stocks on offer from top brands in the world including Coca cola, IBM, Lukoil, Nike, Tata, Apple, Amazon, Yandex, Facebook and other blue chip companies. Expert Option has strong customer support for all types of account holders. Every trader is assigned a broker to assist in placing the trades. Live video chat on the site is available even for guest users. Traders can also make customer service enquiries on phone, Skype, and email. Account opening – Forcing a new user to make a deposit before exploring the site is a bit weird as many new users will want to feel out the site and try out demo trading before committing to make a deposit. But this could be a policy to keep jokers out. Short trading durations - A maximum of 15 minutes limits when good opportunity is available to ride a bull run. Expert Option has a lot of good features and a good legal backup to be considered a not trusted broker. If you want to join this Binary Options Broker, click here. Expert Option appears to be a seriously robust platform. However, for this performance it is a suitable binary platform for experienced traders who are a bit deep-pocketed. We also recommend you to check our Trusted Brokers and our Broker Reviews Section.